A.J. 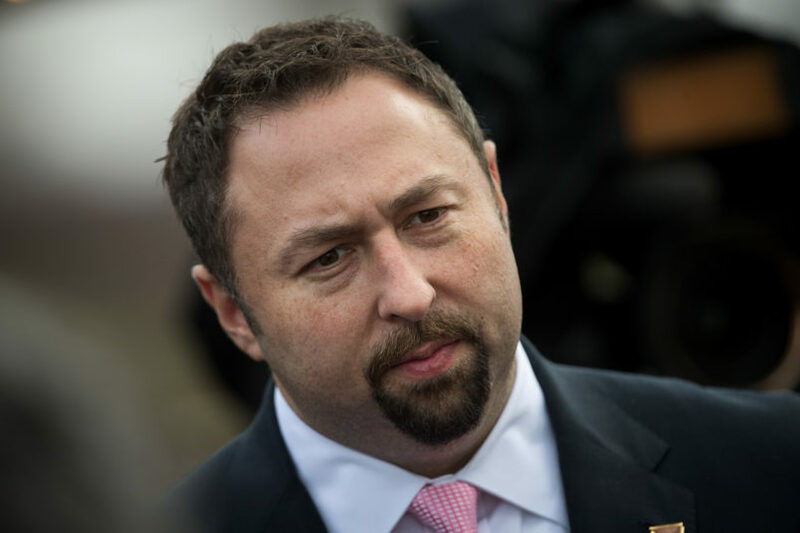 Delgado feels she has been misled by Jason Miller since the two first started dating while working as high-profile spokespeople for President Donald Trump’s 2016 campaign. At the start of their relationship in October 2016 — when she became “a mistress without knowing it,” she said — Miller told her that he was separated from his wife and regularly spoke with Delgado about the stress the couple’s split was causing him. He confided in Delgado about meetings he apparently had with divorce accountants and told her he was worried that his wife might move away with their daughter. But that wasn’t the case, Delgado later learned. Miller and his wife were still married, and expecting a child. So, too, was Delgado, who found out she and Miller were pregnant not long after the 2016 election. Now, a year and a half later, Delgado is locked in a bitter custody battle with Miller over their son that began nearly nine months ago: A “no end in sight” series of expensive court proceedings that Delgado thinks is largely fueled by Miller’s desire for retaliation. While Delgado says she did not want to have to speak out publicly regarding her affair again after she gave an interview to the Atlantic in August, she said she’s driven by her desire to bring awareness to the broader issue of “corruption” within the family law system, especially in Miami-Dade County in Florida, where she’s currently living. Miller is now the managing director at Teneo Strategies and appears as a paid contributor on CNN. Now, with an eight-and-a-half month old son, William Linares Delgado, A.J. Delgado is working her way back into the political sphere, currently serving as a senior adviser for a Trump super PAC from Florida. In her new gig, she said she makes a “decent income” – a little more than the $120,000 a year she earned doing non-profit work. But she can’t afford the average $20,000 a month in legal fees that have been mounting since Miller dragged her to court the day after their son was born. “I don’t even make that in gross income, forget net,” she said, adding that in total she owes about $100,000 in attorney fees. She had legal representation for several months, but, since February, doesn’t have a lawyer representing her in the case because she couldn’t afford the retainer, she said. Throughout the entire pregnancy, Delgado said Miller was silent. He never contacted her to see if she and the baby were healthy and, she claims, didn’t acknowledge the child’s existence until he found out it was a boy. After giving birth in the summer of 2017, Delgado had been out of the hospital for just five days when she was slapped with a court order demanding a paternity test, on July 18, 2017. Still recovering from the c-section delivery, Delgado attempted to push back on the order and provided the court with a letter from her pediatrician at the time, who said it was in the best interest of the newborn to not be subjected to a paternity test until he was two months old, according to Delgado and a copy of the letter shared with TPM. According to Delgado, the physician’s concerns were ignored and the judge granted the request, ordering her to comply with the test within seven days. “I had no choice but to have it done on the 25th, with my c-section scar still fresh and Will’s eyes barely open. If not, I would be arrested,” she said. The court proceedings have been a “hellish” nightmare for Delgado ever since. According to Delgado, Miller has asked for 50-50 custody of the child, a move she called “bizarre,” “worrisome” and borderline “abusive,” given the fact that the two former Trump campaign staffers live in separate states. As the litigation expenses began to pile up, Delgado said she sent Miller a written letter in October to attempt to resolve the issue out of court, but she said her plea was ignored. Here's Jason Miller saying outright he doesn't want Will growing up w/ a single mother (apparently just because his own mother was awful at it). Delgado said she knows there are other women, who may be worse off financially than she is, who are attempting to navigate the family law court system, which she feels is not only sexist, but also elitist. In her experience, family court favors the wealthier parent who can afford not only the legal fees, but is also able to hire experts and witnesses to testify on their behalf. According to Delgado, Miller has brought in paid psychologists who have not only argued in Miller’s defense, but also blatantly tried to discredit her. She said going into debt — “I have peanuts in my checking account,” she said — instead of saving for her son’s future, is due, in part, to the fact that the family court system appears to allow the cases to be done “piecemeal style.” If Miller would allow the case to go to trial, all the issues would be resolved at once, she said. “I’m disgusted by what the justice system is able to do,” she said, claiming she feels as though she has to constantly fight against the appearance of looking like an “angry gatekeeper mom” in court while Miller faces no such burden. During one hearing a few months back, she said Miller “stormed out” of the courtroom when he didn’t get his way. “If I had done that, I would have lost the case,” she said. Despite the debt and the bias she said she’s facing with each new pleading, she’s staying put.